Easter in the Lake District is a special occasion, Spring is in the air and there is plenty to see and do, with events and attractions to suit everyone. On top of this you can enjoy FREE walking boot hire from George Fishers in Keswick, as well as discounts to 21 local shops and attractions when you stay at one of our seven Lake District Hotels. Book our Latrigg Break and enjoy 2 nights dinner, bed & breakfast and we’ll throw in the 3rd night B&B for FREE. Once you have joined us, why not pay a visit to the newly refurbished Lodore Falls Hotel and let us know what you think of the stylish new look. 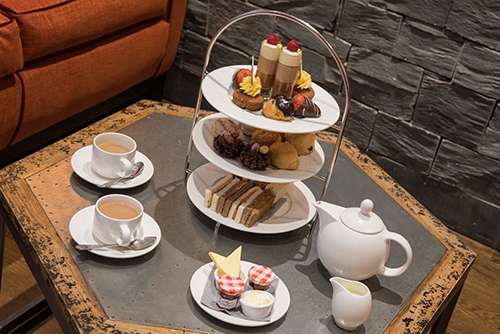 You could even treat yourself to lunch in the Lake View restaurant or if you have a sweet tooth, indulge in a chocolate Easter afternoon tea. If you fancy staying in Keswick, pop to the Skiddaw Hotel and take a seat in the airy conservatory, from here you can watch the world go by. 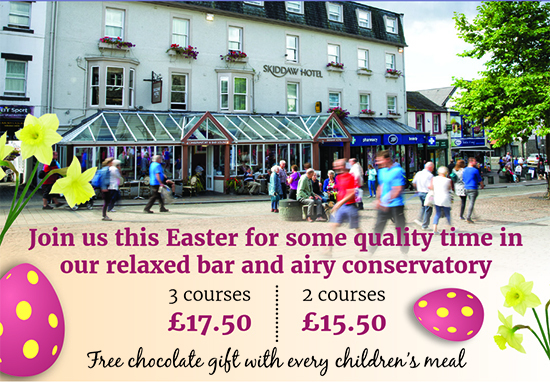 Through the day enjoy a spot of lunch, then at night kick back and relax with live music from Evie Plum on Good Friday, Rory Connor on Saturday and Diva 3 on Easter Sunday. At Lake District Hotels, we like to work with local companies to give guests the best value – so if you’re new to walking, don a pair of boots and try it for free, exclusively from George Fisher in Keswick. Why not pick up one of the Hike or Bike books from the hotel receptions – just £2.95 and includes 16 great walks from the door of your hotel.